Some chocolates are like old friends. You loved them once, long ago, and so you can never forget that affection and will continue to love them still, no matter what changes as the years go by. I wanted to try out the new line, starting with the Clair de Lune bar. But I've had it sitting waiting for at least a couple of months now: I had so many other things to review first. Now at last I turn to the patient Guittard chocolate. Just because I liked the old packaging more, doesn't mean that this one is bad. It's fine; I just don't love it. A simple dark blue background is the base for all the many descriptive words chocolate bars must now have, including the blend number (49, though I honestly don't see why there is a number in addition to the name). Other than the Fair Trade and non-GMO and 85% cacao notes, what is also interesting is the mention of no added cocoa butter. Cocoa butter is included in the cocoa percentage of a chocolate, and sometimes companies add in a little extra; Guittard didn't. Not exactly abnormal for a decent dark chocolate, but still good to note. The card box folds open like an envelope to reveal some pictures of cocoa beans behind the hand-wrapped foil bar. There is a small slit in the envelope, allowing you to tuck the box closed again. The bar of chocolate is rather stripey, with just one blank space for the name. And I don't like the stripes: they remind me of cheap chocolate. Just get rid of them in favor of something else, some other design. Fragrant, the chocolate smells rich and deep. In texture, it's a little hard and needs a couple of chews to get the melting started right. Perhaps it's older than it should be since I've had it sitting for a while, but it's still about a year away from it's best by date. The flavor starts off a tad on the bitter side, the earthy kind of bitter rather than the biting kind. Then it mellows out into warmer tones. The box tells me it has cherry notes, which I can neither confirm nor deny--but that sounds about right. It isn't highly fruity or citrusy; it isn't floral, either. But it does have that warm tanginess (as opposed to bright tanginess) that usually is called cherry notes. It's up there in the cocoa percentages at 85%. Sometimes this is my favorite range: it isn't difficult enough to make for there to be too many problems developing flavor and texture and yet it's dark enough that you can taste the chocolate more than the sugar (there is also some vanilla in here). It's a pretty nice dark chocolate, not too complicated or too subtle in its delivery. Very straightforward. It's just nice, not really asking for anything in return except for you to take a quiet moment to eat it. No need for anything more. A good chocolate to just keep around the house for when you want a little dark chocolate or when you want something for a recipe. 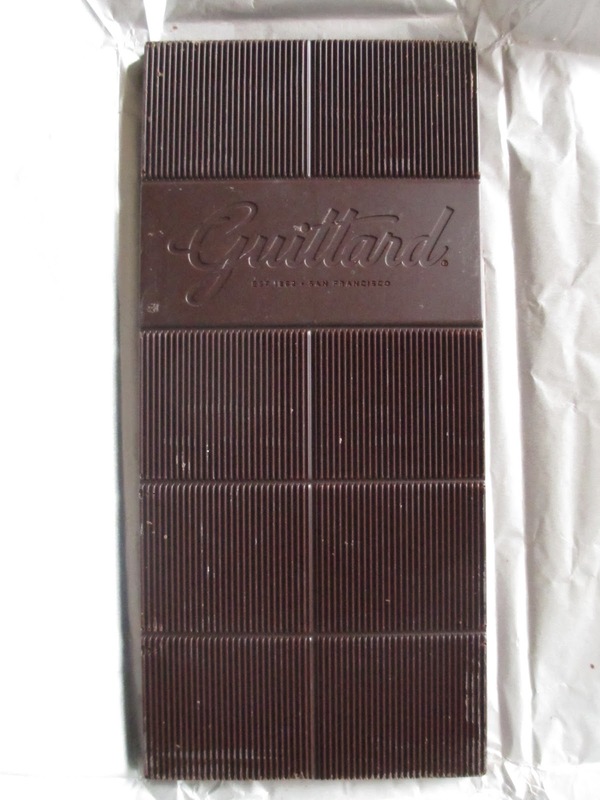 Guittard is among the more affordable chocolate brands, and also the more accessible, at least where I am (World Market is currently carrying their line). I wouldn't call it a special occasion chocolate; just a steady friend that you know you can count on.